You can transfer your donations to Tung Wah’s account through city-wide “ATM” electronic teller machines at Hongkong Bank, Hang Seng Bank or member banks of JETCO. 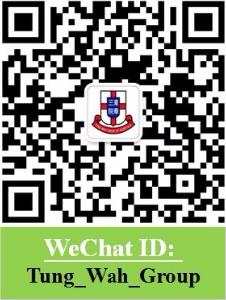 Search for and follow us by our WeChat ID or QR code on the right. 「單次捐款」or「活動贊助」tabs. Follow instructions to make a donation. If donation receipt is not required, you can donate through PPS bill payment service by tone phone or by internet. The merchant code of the Tung Wah Group of Hospitals is 9216. You can make cash donation at any Circle-K without the need to provide barcode (HK$1-$5,000 per transaction). Or you can present the barcode below to make cash donation at any 7-Eleven (HK$50-$5,000 per transaction). You can bring along the donation cheque / credit card / cash to Fund-raising Division of the Tung Wah Group of Hospitals during office hours from 9:00am to 5:30pm, Monday to Friday. You can put your donations into the donation boxes installed at the service centres of the Tung Wah Group of Hospitals. Donation of $100 or more to the Tung Wah Group of Hospitals is tax deductible. If donation receipt is required, please send the original bank-in slip or ATM transfer advice slip or receipt issued by 7-Eleven or Circle-K Convenience Stores together with name and correspondence address of donor to the following address: Fund-raising Division, Tung Wah Group of Hospitals, 12 Po Yan Street, Sheung Wan, Hong Kong. The provision of personal data is purely voluntary. We may be unable to complete the donation transaction through internet if data is insufficient. The personal data provided will be used in processing the donation transaction, issuing of receipt and sending of fund-raising information. The personal data will be disclosed to staff member(s) of Tung Wah and the related bank(s) on a need-to-know basis. The purpose of this statement is to inform you that Tung Wah Group of Hospitals is committed to implementing policies and measures to collect, use, protect and access your personal data in accordance with the Personal Data (Privacy) Ordinance (Cap. 486). The Fund-raising Division of Tung Wah Group of Hospitals (“the Division”) uses fair and lawful means to collect your personal data. Your personal data is collected for the purpose of processing your donations instructions and making necessary arrangements, including for relevant donation matters, issuing donation receipts, managing donation records and accounts, arranging acknowledgments, sending out news or information regarding fund-raising events organized by the Division, events registration and complying with applicable laws and/or regulations. Provision of your personal data to the Division is purely voluntary. You are not compelled to provide your personal data to the Division. Nonetheless, the data which the Division requires you to provide is mandatory and necessary for the Division to carry out your proposed donations instructions and arrangements. If the personal data you provide is insufficient, the Division may not be able to process or administer your instructions and to make necessary arrangements or to provide you with the necessary services. All of your personal data is kept strictly confidential by the Division. Unless with your prior consent, all relevant data (including data which is public and transferrable) can only be used for purposes specified at the time when such data is collected, other directly related purposes or purposes permitted under statutory provisions. The Division endeavors to make all practical arrangements to ensure that all the data it holds is protected, and is not affected by any unauthorized or accidental access, processing, deletion or use. The period for which your personal data will be kept shall not exceed the duration necessary to achieve the purpose for which it is collected. (c) persons/institutions where disclosure is legally authorized or required. In the above circumstances, persons to whom your personal data is disclosed shall only be permitted to use such data for a specified purpose. In other words, the use must relate to donation matters and must not involve the sale of personal data to third party. Furthermore, any personal data you provide may also be accessed by auditors or relevant government regulatory bodies when assessing the financial status and performance of the Division. (e) another data user controls the use of such data and prevents the Division from complying with such requests, in which case the Division shall provide you with the name and address of that data user. The Division reserves the right to amend this “Personal Data Collection Statement” in accordance with the Division’s needs and the Personal Data (Privacy) Ordinance. If the Division wishes to alter the purpose for personal data collection, your prior consent will be obtained.